Many Chinese users of Windows Live Messenger, more commonly referred to as MSN in short in China, have received an email which says the service will close down on October 31st (two months away) in mainland China. To encourage Chinese users to migrate to Skype, the online calling service Microsoft acquired in 2011, each of them will get 2 dollar worth of a coupon for Skype calls. The mainland China was the exception when Microsoft decided to shut down the Messenger in March 2013, for the service was operated locally. I won’t receive the email as the hotmail account I used for the Messenger login has been long abandoned. 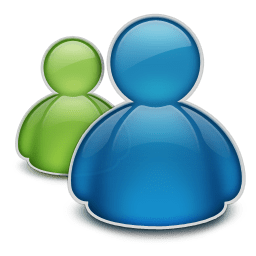 But many years ago, the Windows Live Messenger was way more popular among my friends than Tencent’s QQ or other online instant messaging services by Chinese Internet companies such as Netease and Sina. While back then QQ was popular too, there were several reasons that the Messenger was more welcomed among white collars and college students; for instance, the chances that your QQ accounts would be “stolen” for illicit trade was high, QQ allows random strangers to chat with you (though it’s why QQ was popular with some other demographic groups), some features on QQ such as pop-up windows of news or ads were annoying, and the emoticons and animated letters & symbols on the Messenger were better designed than those on QQ. Officially introduced into mainland China in 2005, the Messenger had been well-regarded before fraudulent messages expanded from QQ to it. Unknowing our accounts were infected by malware, we simply concluded that our accounts were “stolen”. At the same time Tencent made a lot of efforts fighting against malware and have been improving user experience and designs to this day. As of the first quarter of 2013 when Microsoft discontinued the Messenger in the rest of the world, QQ had 825 million monthly active users, with the majority were in China, while Messenger only had over 100 million users worldwide. Peter Zheng, current vice president of Tencent, left the MSN where he was in charge of MSN Spaces, a blog service, and MSN Shopping, to join Tencent in 2006 to build Q-zone, a competing service to MSN Spaces. In an interview in 2013, he said back in 2006 he clearly felt international Internet companies couldn’t catch up with the changes in China’s Internet market and could hardly be into the shoes of Chinese Internet users. I was once a big fan of MSN Spaces and stopped using it when almost all of my friends moved away from MSN. Q-zone, launched in the same year as the Messenger for China, would have 611 million monthly active users as of March 2013 and 645 million as of last quarter. Q-zone has been one of Tencent’s major revenue generators that makes money through premium virtual item subscriptions and advertising. It’s unknown how many users MSN still has in mainland China. What’s well-known is everyone in China is now on WeChat, the mobile instant messaging app developed by Tencent, that had had 438 million monthly active users in China and overseas combined as of Q2 2014.